They come from every ITER Member and contribute to the ITER Project in many different areas. The ITER Project Associates are a new type of resource in the ITER workforce, particularly in the scientific and technical departments. Over 70 Associates have taken up their positions since 2016. 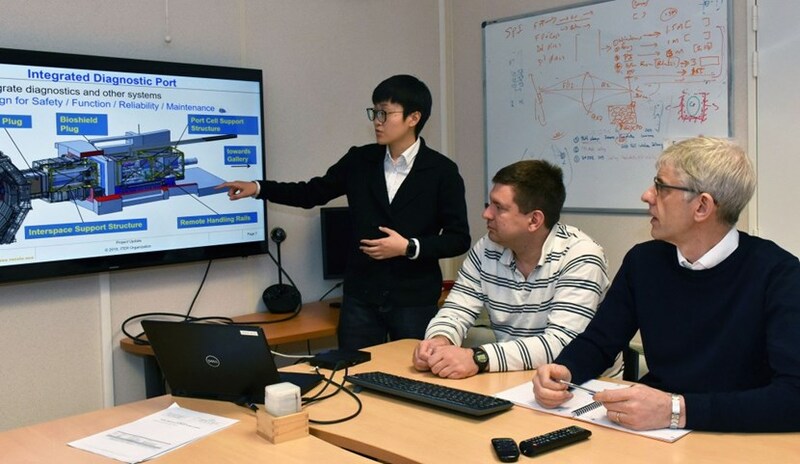 For Division head Michael Walsh (right) and Section head Victor Udintsev (centre) the contribution of ITER Project Associates like Hu Xiaoyue, a computer model specialist from China, is indispensable. Hu Xiaoyue is a young mechanical engineer from the Institute of Plasma Physics at the Chinese Academy of Sciences (ASIPP). Half a year ago, she moved to the south of France to take up her assignment as an ITER Project Associate (IPA) in the Port Plugs & Diagnostics Integration Division. Xiaoyue's field of expertise is computer model design. "I use computer programs like CATIA to coordinate the complex integration of diagnostic systems into vacuum vessel ports," she explains. The IPA program seeks to leverage qualified resources from the ITER Members through the placement of personnel from public or private home institutes at ITER for a maximum of four years. The Associates remain employed by their home institutions, while contributing expertise in a specific domain at ITER through a contract of association. Another goal of the program is the strengthening of relationships between ITER and the Domestic Agencies. Created by ITER Director-General Bernard Bigot in 2015, the program got off to a start at the end of 2016 with the arrival of the first four ITER Project Associates. Since then, their number has grown to over 70 and dedicated efforts are underway to increase their number to 120 by the end of the year. The Port Plugs & Diagnostics Integration Division hosts the largest number of Project Associates, earning Division head Michael Walsh the title of "Champion of the IPA program." All ITER Members are contributing diagnostics to the project and so for Walsh, the enhanced cooperation achieved through the ITER Project Associate program is priceless. Fully integrated into the Division's teams, the Associates add value very quickly. Like Xiaoyue, many of the Project Associates in the Division focus on the integration of more than one hundred diagnostic systems into the ports and the infrastructure of the machine itself. For Victor Udintsev, who runs the Common Port Plug Engineering Section and works with 18 ITER Project Associates, "their work in design, analysis and maintenance is indispensable." The Domestic Agencies also enjoy the benefits. "When people come to work here they will see ITER in reality and feel the challenges we face every day," Walsh says. This experience turns the Project Associates into ITER Ambassadors and an invaluable resource for their home institutes and companies when they return to share their experience. He hopes that, in the long term, many of the colleagues in the Domestic Agencies will join as ITER Project Associates. "We want to keep a strong cooperation with the Domestic Agencies so we can built up the right operating team for ITER." For more on the opportunity to become an ITER Project Associate, see this ITER webpage.